The 6.0-magnitude earthquake that shook Napa and surrounding communities on Sunday was the largest to hit the Bay Area in 25 years. More than 100 people were treated for injuries at Queen of the Valley Hospital, streets buckled and wine bottles flew from store shelves. The USGS has issued an advisory that another strong temblor could happen in the area of the South Napa Earthquake in the next few days, but the chances of that are diminishing quickly. Meanwhile, scientists are still trying to find out more about the fault where Sunday’s earthquake occurred. 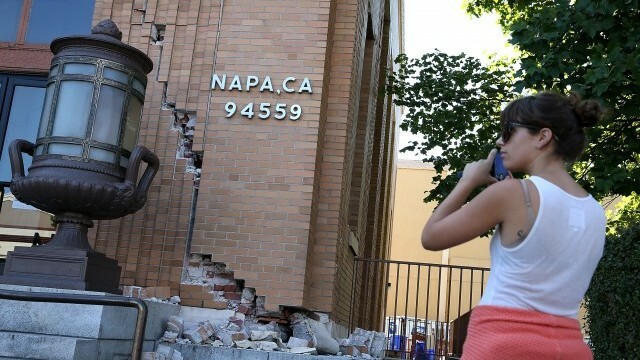 They are focusing on the small West Napa Fault. KQED Senior Science Editor spoke with Brad Aagaard, geophysicist with USGS based in Menlo Park. He explained what experts know so far. Brad Aagaard: The West Napa Fault is a fault that is mapped primarily directly west of the city of Napa, along the edge of the foothills. And as you go further south into the region of the magnitude 6.0 earthquake of Sunday morning, it's expected at the surface to become much less. We don't yet know whether this earthquake occurred on the West Napa Fault or just in its vicinity on a smaller structure. Andrea Kissack: So you're not even sure you know what fault line this is on yet? Do you know what other faults it could be connected to yet, or do you need to know what fault line it is first? There is the Franklin Fault which is mapped in this vicinity, but this also could be on an un-mapped fault that is a smaller structure that is yet to be recognized. Are there other dormant, little-known faults in the area and does this quake change the way you're looking at these less known faults? Throughout the San Francisco Bay Area we are in the middle of the San Andreas Fault system. So even the Hayward Rogers Creek Fault on the east side of the bay is really considered part of the San Andreas Fault System, and there are a lot of smaller structures that link these faults together. We can make magnitude-6.0 earthquakes on any of these smaller structures but we would not expect a magnitude-7.0 earthquake on these smaller structures. We would expect those on our primary faults such as the San Andreas Fault and the Hayward Rogers Creek Fault. What kind of quake was this? Can you tell me more about the mechanics of it? Throughout the Bay Area most of our faults are strike-slip faults, where one side of the fault moves laterally relative to the other side, and this is a result of our plate boundary here along the San Andreas Fault System with the Pacific plate moving to the North relative to the North American plate. With that plate motion being accommodated with one plate sliding past another that's why most faults are accommodating that lateral motion. Sunday's magnitude-6.0 earthquake accommodated this side swept motion and even the alignment of the fault is very consistent with the orientation of the plate boundary. The USGS characterized this as a violent shaking quake but reports from near the epicenter really varied. Some people in American Canyon described only a moderate shaking. Why would there be such disparities? The level of shaking is really controlled by the local ground conditions and precisely where you are relative to where the earthquake is. Locations closer to sediments -- central parts of the river valleys -- where the material is softer, so it tends to amplify the shaking. If you're out in the hills, especially if you're on hard bedrock, you tend to have more rigid material underneath you so that's going to cause a different, lower amplitude of shaking. Also in this particular earthquake, because it was a strike-slip the energy tends to be focused along the fault. So if you're even just a few miles perpendicular to the fault you can have very different shaking than you are if you're aligned with the fault. 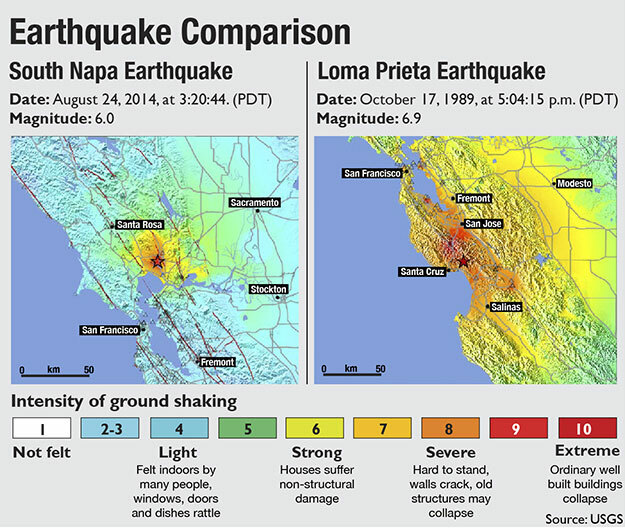 This is the largest quake to hit the Bay Area in 25 years, how much stronger was the Loma Prieta quake and what were the similarities and differences between these two? So the Loma Prieta earthquake was a magnitude-6.9 event and even though it occurred down in the Santa Cruz mountains, closer to Santa Cruz, it did cause damage in San Francisco and Oakland and it was the Oakland area where most of the loss of life was so that sort of gives you the difference in scale between a magnitude 6.9, which releases 30 times more energy than a magnitude-6.0 earthquake. We're seeing most of the damage of this magnitude-6.0 earthquake concentrated within about 10 kilometers or six miles of where the earthquake occurred, and this is sort of consistent with a smaller size event compared to the size event of the Loma Prieta size. There is an early warning system being piloted in California. How did it measure up in this quake? The early warning system worked in this case. The prototype would have provided ten seconds of warning in the San Francisco area and that few seconds of warning is very important for people to be able to take action such as do drop, cover and hold on before the strong shaking hits them. If you're closer to the earthquake you have less warning and so it's a reminder that people need to be prepared to immediately take action, do a drop cover and hold on when they feel an earthquake.